Above: Usually, the kayaks and zodiacs from Safari Endeavour reached empty beaches. 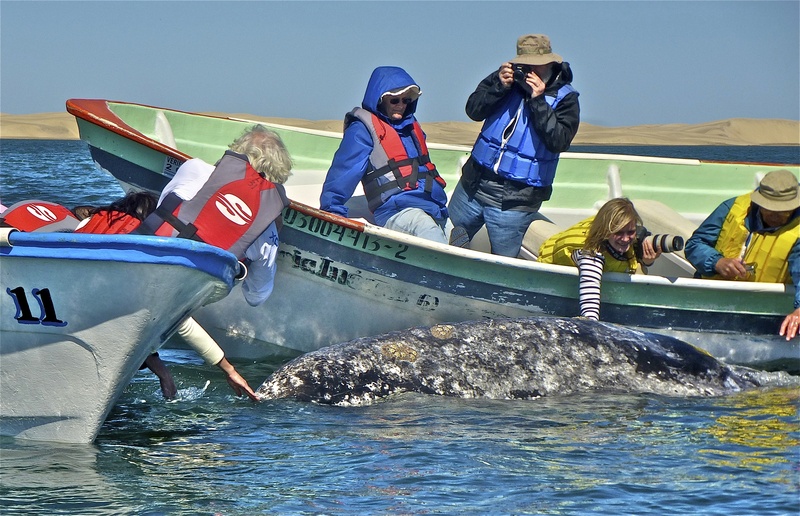 Baja California Sur, Mexico – About to board an open boat for a whale-watching trip, a well-traveled businesswoman says she is a little disappointed in our weeklong voyage through the Sea of Cortes: She prefers a more definite schedule of events, announced well in advance. About an hour later, she and the seven other passengers in her boat experience a thrill that could not be scheduled: A mother gray whale lifted the boat from the water and almost dumped them in a chilly inlet of the Pacific Ocean. The whale was one of the pregnant females who had migrated here from Alaska to give birth. Both adults and calves can be curious about the tourist-filled boats idling in their nursery, the passengers slapping the water to draw attention. 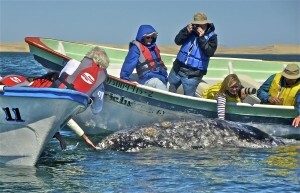 The creatures come to the boats and the humans touch the whales’ rubbery hides. And so it was that when another calf came toward our boat, we leaned over, waiting for the calf to poke its ugly head out of the water. Instead, the mother went under the boat and raised it from the water, at a frightening angle. Just as quickly, she moved from underneath it, followed by our whoops of joy. Thanks for the once-in-a-lifetime thrill. From points as diverse as England and Florida, 30 of us had boarded the Safari Endeavour (cq) for the chance to observe not just whales but dozens of other creatures in the water and in the air, and to marvel at the plant life in the arid Baja California Sur peninsula. The Baja (bah-HAH) extends southward hundreds of miles from the U.S. border and is separated from mainland Mexico by the 109,000 square miles of the Sea of Cortes. It was Jacques Cousteau who termed this “the world’s aquarium” due to its astonishing variety of life. Safari Endeavour passengers on my trip tallied more than 60 species of fish, birds, mammals and reptiles. Orcas swim beneath and around the bow of our ship. our bow, gliding on both sides of the vessel. Later, we encountered dozens of dolphin, rapidly leaping from the water during a feeding frenzy. Overhead, a cloud of seabirds waited to dive in. Not two hours after that, a mighty blue whale repeatedly spouted water before finally submerging, well ahead of the ship. None of the day’s events could have been scheduled. None can be forgotten. 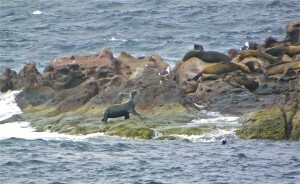 Safari Endeavour departs from LaPaz, the capital of Baja California Sur. The ship heads north, sometimes stopping more than once a day at coves and islands where we often had a wide beach to ourselves. The daily agenda was usually posted the night before on the closed-circuit TVs in each of the 43 cabins. This schedule varied little: options were kayaking, snorkeling, stand-up paddle-boarding, beach combing or low-impact hikes. Passengers opt to do as much or as little as they want. A seal walks through its rookery in the Sea of Cortes. Before the first port of call, everyone was outfitted with a wet suit, fins and snorkeling mask. In the kayaks, in the water and on the hikes, we were always accompanied by naturalist/guides. Beyond the landings, life on board centered around conversation, reading and meals. All beverages, from soft drinks to cocktails, were included in the ticket. Also included in the price: the bartender offering hot chocolate spiked with crème de cacao while we relaxed in one of the two hot tubs, after off-ship activities. Another unscheduled, but welcome, event. Robert N. Jenkins is former travel editor of the Tampa Bay Times. His new e-book, End Bag is available to download for $2.99 at Amazon, Smashwords and Sony sites. Safari Endeavour is operated by American Safari Cruises, whose small-ship fleet itineraries boast first-name informality and a lack of casinos, nightclubs and multiple dining venues. The whale-watching period runs late November through December. For more information, contact a travel agent or go to www.un-cruise.com.